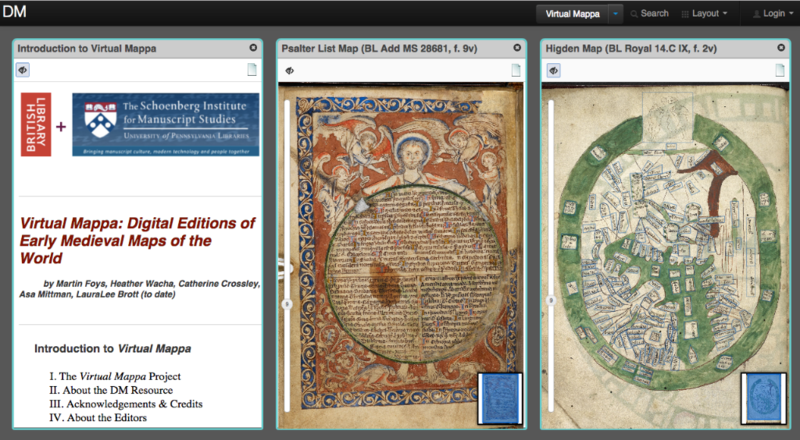 The Virtual Mappa Project and Digita Mappa: Online editions of Medieval Maps from the British Library and elsewhere – full update from Cat Crossley here. After a long journey and much hard work from a lot of very dedicated people, it is time to get excited about medieval maps again! The Virtual Mappa Project has been officially released as an open access publication, with an incredible collection of digitised medieval world maps from the British Library and beyond, all online, annotated and waiting to be explored. Back in 2013 I was hard at work in the BL Maps department, tasked with marking up some marvellous medieval mappaemundi. At that time I documented my work and the project’s progress in a few blogs posts, including this overview available here. To recap, the British Library has lent its medieval manuscripts, imaging studios and hive-mind of expertise to the DM project, to help create a corpus of digital editions of medieval world maps in a visually navigable, text-searchable, translated format, that makes their intricacies much more accessible to modern minds. A full history of DM and everyone involved can be found here and it is fair to say there have been some technical hiccups along the way (hence the slight delay in publication), but we are now ready to unveil the finished product and I must admit I’m very excited. DM workspace showing two British Library mappaemundi more recently added to the project, and introductory information for the Virtual Mappa project as a whole.